Hello to all and I hope you are enjoying your summer. There hasn't been any hunting taking place this summer, although preparation and thoughts of hunting are a big part of my summer. Here's an update and information about keeping ourselves safe if we get hurt or perhaps have an encounter with a Cougar. I am thrilled and relieved to say that I am 98 % recovered from my knee injury. Just about 6 months to the day. I bought a new road bike the end of May and I have been riding about 100 miles a week. Mostly flats in May and June and then started riding more hills and climbing as my knee allowed. It has been a good season so far and I have roughly another 6 weeks left of serious riding before hunting season starts in earnest. I have mixed feelings when that shift comes as it has taken me months to get into good cycling shape and then it's over. The cold soon arrives and it's back to indoor riding and sweating in one spot. Needless to say not my favorite type of training. I am eager to put in some miles walking, stalking and enjoying the benefits from my miles of cycling. I have added a new piece of life saving information to my cycling and all outdoor activities recently. It is called Road I.D. and there are two versions to choose from. The original which provides 7 lines of personalized information laser-engraved. The newer Road I.D. is interactive allowing you to build a fully up-dateable, secure Emergency Response Profile (ERP) that is available to first responders 24/7 via internet and telephone. I chose the Original Road I.D. for my needs and am glad to have it. It has my name, city, state, blood type, allergies, and 2 contact numbers should the need ever arise. I wear the wrist band on every bike ride and will also wear it when I go hunting this Fall. It gives me an added piece of mind and is quite affordable. The folks at Road I.D. are very helpful with any questions and their service is excellent. I don't carry my wallet into the woods but I do wear, my Road I.D. This will be my first season to attempt harvesting an Elk with a bow. 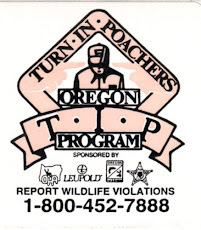 Fortunately in Oregon a bow hunter is allowed to carry a handgun for predator protection. Yea, this is what makes me a bit nervous to say the least. The area I will be hunting has cougars in it. Since Oregon banned the use of dogs for hunting cougars the population has really increased. So has the Black Bear population too. That being the case, Cougars are much less afraid of humans and there have been more encounters here locally each year. Tomorrow I am meeting a friend who is extremely proficient in all areas of hand gun use. Being retired from law enforcement and continuing to participate in competitive hand gun competitions, I am looking forward to quite an education. I will keep you informed as the process unfolds and I make my final decision on just which gun I purchase. 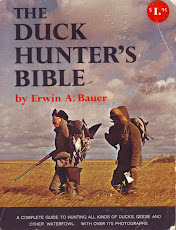 Now moving along to a serious topic which I haven't seen much discussion of in the blogosphere. Let's get the conversations rolling about ways in which we as hunters can protect ourselves from predators while in the woods. Here are a few cougar facts. 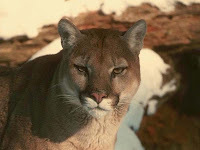 Typically it will be a young cougar who has been kicked out of the family to find it's own territory who is not yet a proficient hunter that may decide to stalk a hunter. Or an older cougar who is not as fast or perhaps has health issues and sees a slow walking hunter which looks like an easy meal. Even if you are still hunting from the ground it is a good idea to continually look all around you every few minutes. A friend of mine who spends a lot of time in the woods was talking with another fellow who told him that these days for every 3 hours you spend out in the woods hiking around, you have been seen by 1 cougar. Remember also that as hunters we are in the food chain wearing camo clothing, scented up like a cow elk or doe in estrus, using calls to entice the bulls or bucks to us and ultimately ringing the cougars dinner bell. Need I mention that we are out there at dawn and dusk when the light is poor to none. That is prime time for cougars to take advantage of a young or slow moving animal. 1. It's a good idea to look behind you every couple minutes. Scan the ground horizon and look for eyes. If you see a cougar, look directly at it's eyes. Typically a cougars prey will not make eye contact. This is a good start to avoid a closer encounter. 2. DO NOT RUN away from the cougar, this will trigger the cats food/prey instincts. Make yourself big, stand up if you're not already and open your coat or shirt and hold it out to your sides to appear larger. You can also growl loudly with as deep a voice as you can. 3. Look up if you are walking under or near rock outcroppings or ledges where a cougar can watch and then jump onto it's prey. The same is true for keeping an eye on logs in areas of blow downs, thickets and old burns. 4. Do not take your eyes off the cougar. Only if the cougar runs away from you is the time to continue on with your hunt. 5. Be ready for the worst and pray it doesn't happen. Have your hand gun or rifle ready and if you feel an attack is eminent don't hesitate to protect yourself. If you do not have a firearm, grab your knife or a big stick. If you have no weapon and you are attacked try to poke your finger into the cougars eyes. Also bear spray can be useful to deter a charging cougar. Make sure you know how to use it and that you point it in the right direction. 6. You can also paint eyes on the back of your hat or hood to help deter a cougar from stalking you. Or wear a Halloween mask on the back of your head that has eyes on it. Well, these are a few important considerations and things to know when you go out in the woods these days. So far I have avoided them but I have had the hairs on the back of my neck stand up a time or two. So has my Black Lab Jet. I have seen a cougars work up close and only hours after a kill. Let me tell you, it wasn't a pretty sight. I am interested to hear about more ways on how to protect ourselves that any of you might be able to pass along. I'll write more about my upcoming archery season and also my hand gun education as it unfolds. Labels: Cougar safety, hunter safety, Road I.D..